From very beginning we’ve been on the ground working alongside the local villages to make change happen. When we first started out in 1994 Australia didn’t have a Virgin Coconut Oil industry. There was no fair-trade act or organic certification for the coconut oil industry. 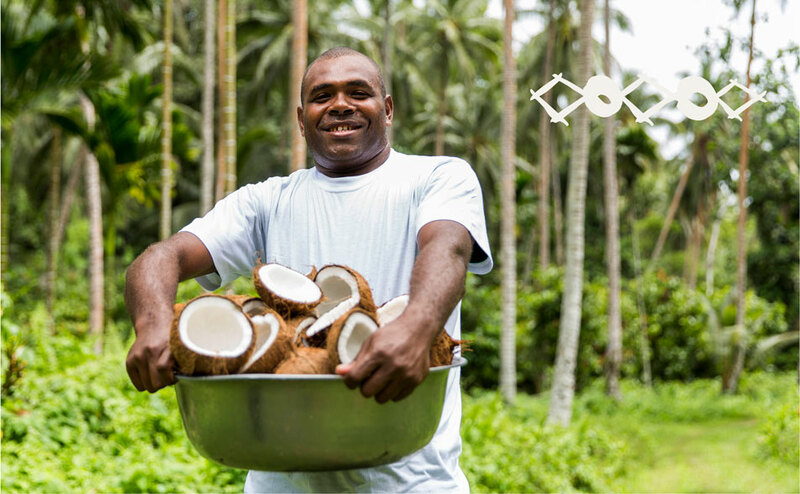 Since then we’ve worked tirelessly with local governments and organic certification organisations, like NASAA, to develop world-class protocols for the ethical and sustainable production of certified organic coconut products. Our entire Niulife range of certified organic gourmet coconut products are made from sustainably sourced, ethically produced, organic wholefood ingredients with 100% of all profits going back to equipping our village communities with everything they need to enjoy a brand new, better quality of life. Each DME® coconut oil press is independently owned by the villages. Not only do we buy every drop of oil that the villagers produce (as long as it meets our strict quality standards) but we give 100% of the profits from the sale of ALL Niulife products back to the villages via our DME® Village for Life™ Empowerment programs. These programs, run by our Village for Life™ Support Teams in partnership with individual village enterprises, equip locals with all the knowledge, skills and tools they need to set up and sustain their own independent small businesses and thriving micro-economy. Every year our team continues to set new benchmarks and pioneer technologies, ideas, and opportunities for helping local villages create additional income streams by turning their coconuts into cashflow. We teach organic sustainable polyculture farming techniques which utilise the space beneath coconut palms to grow other food crops. We show how biofuels from coconut oil can be used to run generators and machinery in place of diesel or petroleum-based fuels. Plus we’re always working to develop new ideas to create additional income, like making soap from the oil, and using the left-over coconut meal from DME® production for stockfeed. In addition to this, our certified organic Cocomino™ Coconut Amino Sauces, Coconut Blossom Syrup, Coconut Vinegars and Coconut Sugars are handmade by local producers in the Philippines who support the empowerment of women living in the area. Watch this video below to find out more about Village for Life™.